From wikipedia: The common kingfisher (Alcedo atthis) is widely distributed across Eurasia and North America and a resident in much of its range, but migrates from areas where rivers freeze in winter. This sparrow-sized bird has the typical short-tailed, large-headed profile; it has blue upperparts, orange underparts and a long bill. It feeds mainly on fish, caught by diving, and has special visual adaptions to enable it to see prey under water. 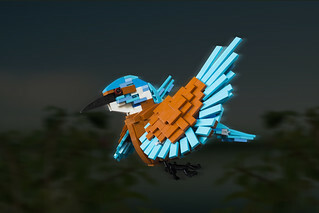 For a contest I spontaneously built this kingfisher over the last weekend. I always loved the vibrant colour combination of its feathering. Both dark orange as well as medium azure have its limits but I think it worked out nicely. Let me know what you think, I'm looking forward to your feedback!